One of the things we love doing is helping our clients realize the power of the technology they already have, especially when it comes to IBM i. Many people think of the system as old and archaic, what with its green screen interface and “rusted in” reputation. But IBM i is a powerful system that should be properly leveraged and modernized as opposed to ripped out and replaced. That’s where our expertise comes in. When thinking of the IBM i system, many people think of a system that has been around for 30+ years – it’s old, archaic, hard to work with, and the green screen interface is anything but slick or cool. Frankly, the IBM i has a reputation of being old and “rusted in." Because these systems have been in place for so long, there are many third party systems attached to it, and these reach throughout the organization. Somewhere in the organization, someone inevitably mandates a more modern system that is easier to work with, has more modern software development tools, and makes the data more accessible to other applications. When this sort of overhaul is being considered, the IT team is often left wondering where to start and what to do next. Instead of ripping out the IBM i and replacing it with something else, consider modernizing your IBM i system. But what does modernization really mean? There are an incredible number of options when it comes to bringing your IBM i system up to date. In reviewing these options, it’s easy to get overwhelmed, and it’s hard to determine which approach provides the best return. Some options to consider specifically are exposing the data and logic that is locked into the 400, improving the user interface, and the software development process. Adoption of new tools, such as IBM Rational Developer for i (RDi), is another big step toward modernization. RDi is a result of IBM’s strategy to provide common development and management tools across operating systems and languages. It is a modern tool set for application development on IBM i systems that replaces traditional development tools like PDM, SEU, SDA and RLU. One somewhat simple solution is to transform the green screen into a GUI screen in what is commonly known as re-facing. This tactic quickly creates a browser-based look and feel without any programming changes. Another option is to separate the business logic from the UI, allowing the same business logic to be used on multiple UIs. Using RPG Open Access makes this option much easier. Some vendors we recommend for green screen modernization solutions are Profound Logic and Look Software. IBM WebSphere MQ Series is a relatively inexpensive tool that delivers tremendous value to the project and team. This software tool is located on the IBM i and optionally on the external system, and provides safe and secure message delivery between the two systems. Mule Enterprise Service Bus is used for our more complex projects and acts as a middleware between two systems. At a base level, this tool processes transactions between the IBM i and eCommerce systems. It is more robust and contains more features than the other options. 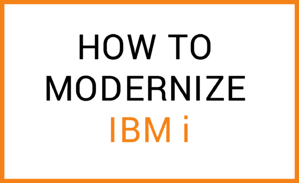 The most important thing to keep in mind when conducting a modernization is that IBM i is still a great backend system. It is powerful, reliable, and still has never had any reported viruses. So, how do we know all of those above options work? Because we’ve put them into practice. One example is an IBM i modernization project we did for an independent oil and gas company. This client maintains thousands of oil and natural gas wells in the United States. Their business data and logic was locked in their IBM i and its legacy RPG and COBOL code. They needed to make a change to their backend system in order to eliminate many manual processes, but replacing their existing system with a newer software package was not an option, as the IBM i was working well for what it was intended to do. Instead of undergoing a full rip and replace, our team worked with this client to tackle an IBM i modernization. By leveraging existing IBM i code and data, the client was able to add new features and functions to the software platform that significantly reduced manual processes, increased business efficiencies, and added customer satisfaction. One of the challenges this client was facing was that the legacy ERP system was storing various information about the properties and wells that the client owns and operates. Whenever a new well or property was purchased, that data would be manually entered into their system using their interactive screens. This proved challenging when the client acquired thousands of wells through a single purchase, as all information was entered one well at a time. To solve this issue and set the client up for future growth, we created a process that allows for the uploading of large quantities of data through a batch process. The process uses all of the business logic already contained in the existing data entry process, and the process is fed by data in a CSV file that has the information about the new wells and properties. While doing this project, both the client and our team had no way of knowing that the client’s assets would soon double in size. After our IBM i modernization was complete, the client again acquired a batch of thousands of wells. This purchase came with huge amounts of data that needed to be processed. Using our previously-established solution, our team is currently working with the client to migrate that data into their system. By using the process that we established initially, the migration is going smoothly and the client team is saving both time and money. We are happy to report that by using the tools that our team put in place during the original project, our client is continuing to see success with their modernized IBM i system. Are you ready to bring your IBM i system up to speed? Contact our team to get started.